The Get Active Team held their second annual awards evening in November as a celebration of the contribution that so many wonderful people have made this year to the Get Active Programme. NHS Bolton’s Get Active Team works with community groups and local residents to find easy ways of making physical activity fun and enjoyable and the awards evening celebrated the people of Bolton who got up, got out and got active in 2012. Sam Homer was the host for the evening, getting the audience involved with games and a quiz, a taster session of Zumba led by Get Active Instructors, a raffle with prizes donated from local partners / businesses and of course the main part of the evening, the awards themselves. Guests were also entertained with a surprise dance performance from the Get Active team – Gangnam Style! Individuals and groups were nominated by friends, family and Get Active Instructors to say why they were worthy of a prize. For each category there were lots of nominees, all of which were deserving of an award. This gave the independent judging panel a difficult task to pick just one winner for each category. People were nominated for a number of reasons including their commitment to the programme, overcoming personal challenges, improvements to health and the support they give to others looking to become active. Cecillia Eccleston – (Kearsley health Walk, Zumba Gold & Swimming). Lesley Jones, Deputy Director of Public Health, NHS Bolton, who presented the Health Improvement Award said "The Get Active Awards evening was a fantastic evening which recognised the amazing achievements of Bolton people in improving their health and quality of life through becoming more active and those who work to motivate and support them. The thing which struck me most during the evening was the great camaraderie and the zest for life that the Get Active Programme has inspired among all those involved." 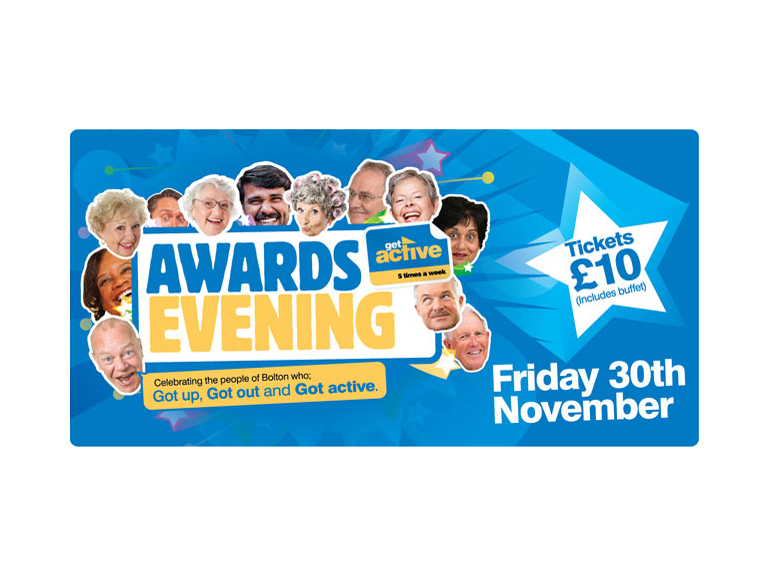 Anna Roberts, Get Active Co-ordinator, NHS Bolton, said "The Get Active team were delighted to be hosting the second Annual Awards Evening, the feedback from the event has been unbelievable. It was great to see so many fabulous people from across Bolton, come together to acknowledge the achievements that have been made over the last 12 months through physical activity. The support we have had from partners in making it a success has been fantastic. I am honoured to be working with an amazing team of people who work so hard, without them; the Get Active Programme wouldn't be what it is today!"